I discovered Michael Moorcock during the late 1970’s. I was in High School and it was right about then that I got turned onto Sword and Sorcery thanks to John Aiken, a guy who I hung out with a lot back then as we went to the same high school and shared a love of comic books and fantastic fiction. Thanks to Marvel Comics “Conan The Barbarian” I discovered Robert E. Howard and it was John who handed me a copy of “Elric of Melnibone” and said that if I liked Howard then I would love this guy. And John was right. I devoured Moorcock the same way I devoured Howard. And after I read all the Elric stuff I went on to read Corum and the Hawkmoon books, which I still think would beat the snot out of the “Lord of The Rings” movies if they were done right. In fact I loved everything Moorcock wrote until I hit the Jerry Cornelius books. Jerry Cornelius is a character who appeared in a long series of novels and anthologies written by Moorcock from the 1960’s up until as recently as 2008. The first novel “The Final Programme” which is based on the movie we’re talking about now is for me the most accessible one. It’s also the most fun to read as for the first half it’s a modern retelling of a significant part of “Elric of Melnibone” with Jerry Cornelius as Elric, his brother Frank as Yrykoon and their sister Catherine as Cymoril. In the later novels I simply couldn’t get into what Moorcock was talking about as Jerry Cornelius became not a character but an avatar for Moorcock to explore his own opinions and thoughts on social issues. The Jerry Cornelius books became more about social satire and philosophy than anything else. Forget about the action adventure we were promised in the first book. THE FINAL PROGRAMME follows the first half of the book pretty closely. Jerry Cornelius (Jon Finch) superspy, adventurer and Nobel Prize winning physicist is summoned to attend the funeral of his father. At the funeral Jerry is approached by a consortium of scientists led by the enigmatic Miss Brunner (Jenny Runacre) who need a microfilm Jerry’s father had. The microfilm has the secret of “The Final Programme” a genetic code that will create a new being, a messiah that will lead mankind out of the end of the world that is soon to come. Jerry really isn’t interested in all that. He just wants to get his sister Catherine (Sarah Douglas) away from the sinister clutches of his insane brother Frank (Derrick O’Connor) Frank has Catherine captive in the Cornelius ancestral castle which is protected by all sorts of lethal booby traps that can only be navigated by a member of the Cornelius family. Turns out that Frank has the microfilm and that sets off a worldwide chase after Frank. Eventually Jerry gets hold of the microfilm and turns it over to Miss Brunner and her scientists. But then he finds he’s in even greater danger as Miss Brunner considers him prime genetic material for the creation of her new messiah. The main reason to watch THE FINAL PROGRAMME is the direction of Robert Fuest who not only worked on “The Avengers” but directed “The Abominable Dr. Phibes” “Dr. 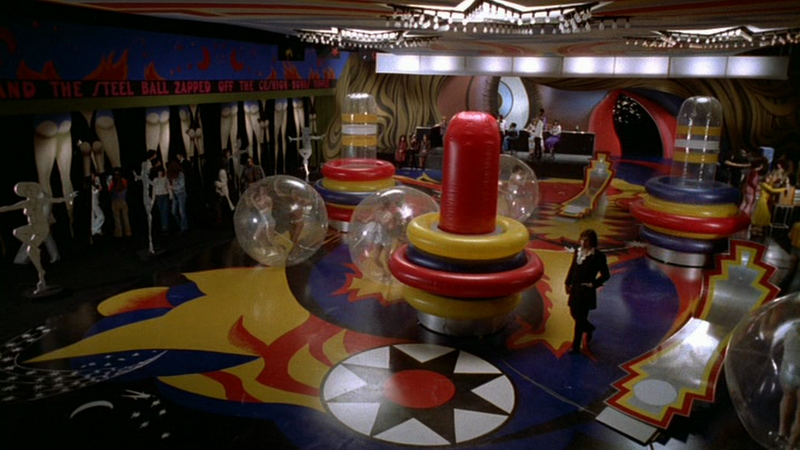 Phibes Rises Again” as well as “And Soon The Darkness.” He throws in a lot of eye candy and wacky set pieces such as a vertical chessboard on a door. The only way to open the door is to move the pieces in the same manner as a famous chess game. If you don’t… There’s a scene in a club that is a giant pinball game where scantily clad girls and patrons are inside clear plastic balls. Jon Finch is actually quite good as Jerry Cornelius and I wish he’d been given a better script to work with. He plays Jerry as a cynical superhero and it’s a lot of fun to see him run around with his needle gun in his black suit, gloves and frilly shirt nemesising evildoers when the script lets him do so. Jenny Runacre’s Miss Brunner is a character that shows a lot of promise in that she appears to be some sort of vampire that feeds upon the lifeforce of her lovers, male or female. But this is just another promising plot element that is left unexplained. Still, Miss Runacre commits herself to her character and that’s all I can ask from any actor. Should you see THE FINAL PROGRAMME? I would say Yes. Especially if you’re a fan of the work of Robert Fuest. The movie has some wonderful set designs and the energy of the actors can carry you past the dull parts as everybody in this one gives it their all. Mind you, it’s not a good movie and that ending is nothing less than than a slap in the face to the viewers who have committed their time to this movie. Still, it’s eccentric enough that I can recommend it to those of you who are Michael Moorcock fans like me who may be curious enough to check out what is the best known adaptation of his work to date. Enjoy.